Operate all special needs software that can be operated by a mouseclick (like ours!) or simple keystroke(s). Access all regular software, like that from any computer store! The switch-user does all the clicking of the mouse, through SAM, while you move it. This turns any computer activity into great cooperative fun. Allow a person with gross-motor hand (or fine-motor head ) control to move the mouse, and do the clicking, double clicking, and click-lock (for drag) with other parts of their body. Give complete computer control, of any software, to a single switch user via our CrossScanner. 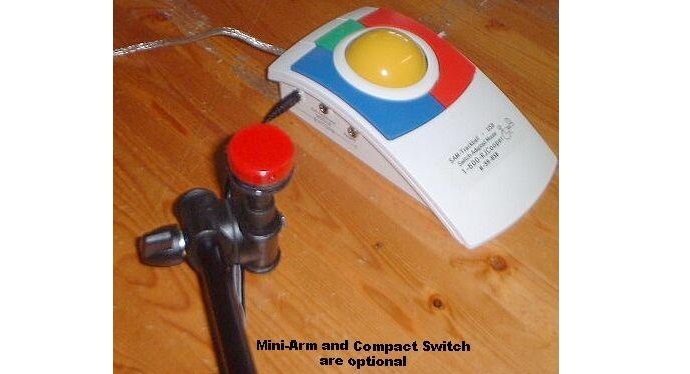 You simply plug SAM-Trackball where your current mouse is, and plug your switch(es) into SAM. A switch plugged into one of SAM's switch inputs acts as the corresponding button, function.